The InChI Trust, a not-for-profit organization formed to expand and develop the InChI Open Source chemical structure representation algorithm, was formally launched in July 2009. Originally developed by IUPAC, the International Chemical Identifier (InChI) is an alpha-numeric character string generated by an algorithm. The InChI was developed as a new, nonproprietary, international standard to represent chemical structures. The Trust aims to develop and improve on the current InChI standard, further enabling the interlinking of chemistry and chemical structures on the web. The connection with IUPAC is maintained through IUPAC’s InChI Subcommittee. 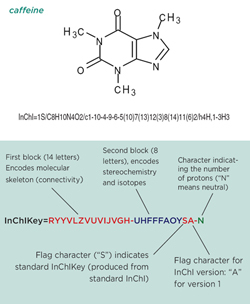 The InChI algorithm turns chemical structures into machine-readable strings of information. InChIs are unique to the compound they describe and can encode absolute stereochemistry. Machine-readable, the InChI allows chemistry and chemical structures to be navigable and discoverable. A simple analogy is that InChI is the bar-code for chemistry and chemical structures. The InChI format and algorithm are nonproprietary and the software is open source, with ongoing development performed by the community. The InChI Trust was formally incorporated in the UK in May 2009, and now has six charter members: The Royal Society of Chemistry, Nature Publishing Group, FIZ-Chemie Berlin, Symyx Technologies, Taylor & Francis, and OpenEye. More organizations and publishers are in the process of joining the InChI Trust. Since the introduction of the InChI in 2005, there has been widespread adoption of InChI standards by public databases and journals. Today, there are more than 100 million InChIs in scientific literature and products. To date, numerous databases, journals, and chemical structure drawing programs have incorporated the InChI algorithm. These include the NIST WebBook and mass spectral databases, the NIH/NCBI PubChem database, the NIH/NCI database, the EBI chemistry database, ChemSpider, Symyx Draw, and many others. The initiative serves chemists, publishers, chemical software companies, chemical structure drawing vendors, librarians, and intermediaries by creating an international standard to represent defined chemical structures. This provides a consistent, credible, and compatible way for databases of chemical structures to be linked together for the benefit of users of chemical information around the world. For further information, contact Stephen Heller at <steve@inchi-trust.org>.